President Assad of Syria is the leader of a sovereign nation, a member of the United Nations and one who for some reason has drawn the ire of the Obama regime. His army was attacked by US led coalition troops, an act of direct aggression which they don’t deny, but are claiming was merely an accident. 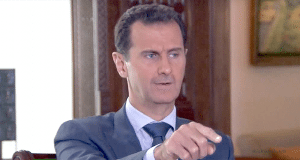 They’re engaged in a proxy war against Assad, but somehow messed up and attacked him directly. Assad doesn’t buy the story of the notorious pathological liar Hussein Obama. He offers some legitimate reasons in making his case. He points out that it was not the action of one air plane for one split second. Rather there were four aircraft involved and they attacked multiple positions for more than an hour. The target was not restricted to a single building and a camp, “they were attacking a huge place, constituted of many hills,” said Assad. There was nothing adjacent to the Syrian troops. He notes what should be a disturbing connection for Americans, his claim that ISIS militants attacked the soldiers immediately following the American strike. He’s asked if the Russians attacked the UN humanitarian convoy as is being claimed by the Obama regime. Assad says there have been many convoys of this nature over the past few years, none have been attacked before, it makes no sense that Russia or Syria would attack them. He says the American politicians and media are lying about what is going on in that nation. Assad points out that the convoy was in an area controlled by the ISIS terrorists, the allies of the Obama regime both inside Syria and around the globe. They simply did what terrorists do; they certainly have the weapons, provided by the good parasitic Obama patsies, the people of the USA. Assad is under attack by a hijacked American government led by a criminal that is looking to remain in power, provide an advantage to Hillary Clinton in the election or perhaps perform as commanded by his globalist masters prior to his exit. The lies to cover such an action have become commonplace, with it now assumed both within and outside of the United States that anytime Obama is talking he’s lying and scheming towards some type of anti-American, belligerent or self-serving end. It is not a coincidence that all of this is happening after the supposed diplomatic efforts of Obama and Kerry with Russia for Assad to take a Gaddafi-style death march out of power failed and they’ve been faced with no diplomatic options to achieve their goal of a regime change in Syria. Now the Obama syndicate is doing what mobsters usually do, resort to thuggish intimidation to pressure their adversaries into compliance. If they have to they’ll take us to war, which is the message this first strike, the staged accident in conjunction with the terrorists of ISIS, was intended to deliver. Obama’s had to move up his timetable as Clinton fades and had to become more aggressive in his war-mongering. He’ll do what it takes, create a false flag as necessary, to pin the responsibility on others and claim he had no alternative but to strike. There will probably be some urgent humanitarian situation, like the claim in Armed Services Committee hearings that we need to act immediately to stop the barrel bombs as “justification.” John McCain and Lindsey Graham, two global establishment tools were stirring the pot, making Obama’s case for war on his behalf on Thursday. None of them want Donald Trump to come to power as he will put the brakes on their power mad global rampage. They will act preemptively to improve their position. Two of those initial steps were likely the topics of this video. It’s a sad state of affairs in America when we must turn to a Russian network for an alternative to the official state run messaging of the hijacked Obama disinformation machinery.